Rural Affairs, Climate Change and Environment Committee members visit the River Dee in 2012. We maintain a regular dialogue with MSPs, Scottish Government, SEPA, SNH and Local Authorities on matters relating to fish, fisheries and the aquatic environment. Fisheries management is primarily about the removal, management and mitigation of impacts on fish and their habitats and therefore we have established a working relationship with a range of key industry sectors and developers to ensure that any potential impacts on fish are appropriately addressed. Fisheries Management Scotland responds to a range of national consultations in partnership with our members. We also respond directly to applications for offshore wind, wave and tidal energy developments, if they are located in strategically important areas and we consider that they have the potential to impact fish from a range of riversFurther details can be found on the publications page. 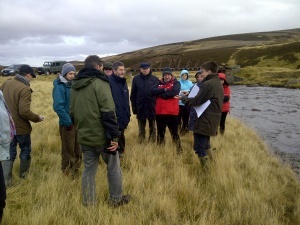 Fisheries Management Scotland play a key role in coordinating our members’ responses to a range of local developments. DSFBs are statutory consultees for fish farming developments and are routinely consulted on a range of other developments. Fishery Management Scotland acts as a convenient central point for Scottish Government and developers to seek views on local developments. On that basis we receive notification of all Section 36 and Section 37 Applications (Electricity Act 1989) and all marine licence applications in Scotland, and ensure that the relevant local DSFB/Trust is alerted to any proposal. Where developments are of particular local concern, from the perspective of fish or fisheries, Fisheries Management Scotland will also support our members by engaging in the planning process for local developments and facilitating legal advice and other support.